Sometimes we think we are ‘bullet proof’ and some of the things we do and survive are considered by many to be crazy, and by others as super human, but when it all boils down we are human. On the Friday and Saturday before the race, I cleared my appointments in Durban, and relaxed and chilled out, something I had never done before. I was in bed at 6-30PM on the Saturday Night, rose at 1-30AM after a great sleep, feeling great, and on the bus at 3-30AM heading the to the 5-30AM start . No stress, I was feeling good as I entered my the start corral. After the start, at about the 1 km mark, my legs seemed heavy and fatigued, and although I have a Sub 9hr dream, about 3 weeks ago I recalibrated it to a safe sub 10hrs. I also changed the screen on my GPS so that I would only see the race time, distance run, and my current pace. I couldn’t see the splits, which would relieve some pressure, and the current pace was used to check my speed on the down hills, this I thought was a safe plan. By about 20km in my legs had come good and I was feeling great. Drinking at every 2nd drink station (about 3km) as it was going to be hot as we approached the finish. (30ºC/80ºF). I was eating well, and all was good in my world as I moved down the road to Durban with 14,000 of my closest friends. About 40km in (50km to go), I was feeling a little bit nausea, hoping to settle my stomach down, I opened my secret stash of ‘ginger’, which I carry for such an emergency. About 500 metres before half way, I took my eyes off the road and tripped, and did a roll on the ground. Got picked up by fellow runners, with no obvious damage, except to my pride. Went through the half in 5-07, which I was happy with, and then started the climb out of Drummond, although not steep is pretty continuous for 6 or 7km, again not feeling good, and having trouble keeping any solids down, so I throttled back a little more, resigning myself to a 10-30 finish. The temperature was also rising, so fluids would be important, so without solids, I decided to go the coke and water option at every drink station, which would amount to about 100ml of water and 50ml of coke every 1.5km or so. As always, I was relying on Berrocca (which I was carrying) for my electrolytes. With about 35km to go, desperate to force some solids in, I took half a honey sandwich from a spectator, and I needed to walk 200metres to force it down. With 32km to go, out of nowhere came the cramps from hell, there was no warning, and I hadn’t cramped in a race for about 10 years, as I tried to stretch these out, they got worse, and I literally laid on the road to relieve the pressure on them, and while on the ground, I could feel the urge for a No 2, so up I got, and hobbled/walked 500metres to a portaloo, where nothing happened, so out of the loo and back on the road, where a spectator gave me a bottle of something (an apple flavoured fizzy drink) which was great, as I walked and jogged the cramps out I started to come good again. Went through the Winston Park timing mat just under 7 hours, which gave me about 3.5hours to run the last 30km to get a Sub 10hrs 30mins, which was only 7mins/km, so on I pushed. The cramps were not completely cleared, but walking and jogging was moving me forward. I was walking jogging about 50%/50% up the hills and running about 90% of the downhills, but I knew I had dropped off 7mins/km pace, but no worries, as a Sub 11hrs was still OK. I crested Cowies Hill in under 9hrs, which left me 2 hours to run 17km for my Sub 11hrs, and although I was still running 90% of the down hills, I was only running about 30% of the flat and 15% of the hills and getting slower, so I knew that Sub 11 hrs wasn’t going to happen, but a Medal was in the bag, as that gave me 3+hrs to cover 17km, and at 10mins/km I could just walk all of the way. In hindsight, I wish I had walked from there. I was still trying to eat, bananas and potatoes, but just spat out every mouthful. I ran all the way down Cowies Hill on to the motorway and with 14km to go, and the climb over 45th cutting and Tollgate to come, my running was down to about 10%, but of more concern was my walking, as my GPS was telling me that I was walking slower than 11mins/km, but that was OK, as I was still on a 11-45 finish schedule by walking. On the run down 45th cutting towards the N3 on ramp, I was struggling to run downhill, so I just soldiered on, my legs were hurting, but my spirits were high, Comrades Medal No 8 was just 8km away. I crossed the 82km timing at 10hrs 40mins, which gave me 80mins to run/walk 7km, this was going to be close, but with 1 hill and 5km of flat or down hill, easily doable. On the on ramp to the N3, Sam walked and I walked (so were almost all of the other runners) with Sam about 15 to 20 metres in front. About 10 metres later, I stopped in my tracks, like if my feet were glued to the road. I remember staring down at my feet urging them on, but I couldn’t move them, I had ground to a halt. I shuffled sideways across the slope to the edge of the road, where I decided it was time to throw up. I had wanted to throw up for about 6 hours, but knowing the risk of dehydration, I didn’t, but now it didn’t matter, I was within the shadows of the finish stadium, I had 3 drink stations to go past, and while I was standing still, the clock was still ticking. But I couldn’t, I just dry retched. Still unsure what was happening, I decided that if I sat down for a minute or 2, I would recover enough to continue, which I did in the gutter, and that’s where things got serious . I have read about Polar explorers, and Alpine climbers who have got into trouble and just sat down for a few minutes, and those who have survived remember uttering the same words before they lost consciousness and those words are: “I just need to sleep for a few minutes”. I remember uttering those words, before I lost consciousness. I don’t know how long I lost consciousness for, but it was probably only 20 to 30 secs, it may have been 1 minute, but next thing I remember was a marshal and 2 runners (who had stopped to help), lifting me back to the sitting position. My glasses were about 1 metre away, I had cut my hand and my leg. As I assessed my situation (which was less than good), I uttered the following words: “It looks like it all ends here”, which it did. I couldn’t stand up, I was less than 1 metre from runners moving forward who were 7km from a finishers medal I wouldn’t get. Then the cramps came back, all of the muscles in my legs then went into spasm. Not sure how long these lasted, seemed hours, but probably only 5 mins. For this who have never been to Comrades, in the last 1 hour, 5000+ runners finish, and where I was sitting at least 2000 of these were about to pass me. 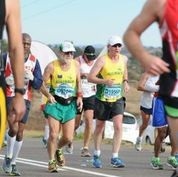 What I saw and experienced in the next 30 or so minutes was the true spirit of Comrades, as these runners all in their own private hell saw and understood my position. I lost count of the number of runners (both friends and unknown to me) who came over to me, trying to lift me to my feet and urging me to join them, because there was still time, but deep down they knew what I knew, that I was going nowhere. -I remember looking up into the eyes of one runner, who appeared to be walking into unconsciousness himself, our eyes meet, no words were exchanged, and out of his hand he released the unopened water satchel he was carry, which landed precisely at my feet, again he realised that my need was greater than his. This policeman literally offered his foot to me as a pillow when he realised I couldn’t sit to keep my head off the road, and still the runners kept coming by. Then came along Ruth, my dear running friend from Melbourne, first we talked, and she was having none of my comment that this is where it ended, I came up to the sitting position, and she reached out with both hands to help me to my feet, as we held hands, I explained why I was staying put, and she had to leave me to get her medal (this was foremost in my mind with all runners who stopped to check on me, that vital seconds would be lost, which might compromise their chances of finishing before the cut off), then as our eyes meet she could seen in my eyes, that I was right and was not going anywhere. What happened next will stay with me forever, and when the time actually comes for me to die, if there is such a thing as an Angel, I want them to be like Ruth. At first I couldn’t work out what she was doing, but somehow she managed to bend over, hold my head tenderly and kiss me gently (which was no mean feat with 82km in her legs), before she pushed onto Kingsmead for her medal. The suddenly, the road was empty, the runners came no more, this was because I was about 100 metres beyond the 82km cut off, and it was now 11hrs 20mins into the race, and that was the cut off time. Shortly after the 1st official vehicle came up the on ramp, which the policeman hailed, and I staggered with help into the back seat, and I bid him farewell. The car stopped another 100 metres up the road, where we folded down half the backseat and the driver lifted the previously unconscious female runner in the back of the station wagon. She had been down as long as I had, but was still cramping, I did what I could to help, but I’m not sure I helped. It was a slow drive down the course with runners all over the road, but we knew that the runners we were passing were not going to get medals, because the 12 hours was about to beat them. Finally we got to the stadium medical facility after the 12 hour cut off, where the other runner ask: ‘Where on the course did you pick me up’, clearly she was worse than me, as at least I was aware. I walked (aided) into the medical tent, whereas she needed a stretcher. If you have never been in the Comrades Medical tent you have missed something. At least 200 beds, doctors, nurses and stretcher bearers everywhere. Before they could give me a bed, I needed to be registered so that people could find me, and while I was sitting, I could feel my core temperature dropping (it was now about 6PM and I was still in my running gear), not a problem, a temporary bed was found, a space blanket and a conventional blanket, plus an orderly to wrap me. Then it was into the main area, where a doctor and nurse were waiting. Those close to me know that for many years I juggle my blood pressure. The further I run, the lower It gets, unless I manage it, well today was a day I clearly got it wrong, so on with the BP meter, and the result was 90/55 which got the doctor’s attention. Remember that it was now over 1.5hours since I collapsed, so my BP wasn’t down to 90/55, it was up to 90/55, which probably explains why I couldn’t lift my feet and why I collapsed. On to the drip I went, and instantly I began t feel better, but the doctor broke the good news to me that I wasn’t going anywhere until my BP came up to something acceptable and I could prove that my plumbing was working by walking to the toilet and having a pee. After the 1st litre went in, my BP was back to 110/70, which was a number I knew I could function at and I walked unaided for a pee, so I was out of there. I walked back to the International tent to find it empty (it was now after 7PM) where I helped myself to a 1.5 litre bottle of lemonade, which I drank in the 200 metre walk back to The Hilton. Approaching the Hilton, I meet the advance search party looking for me (the USA Ambassador ‘Mighty Mark’), and he was pleased that the reports of my death were greatly exaggerated. Off to my room for a shower, and some urgent texts to my family and those close who were not in South Africa, as I knew that they would be concerned about the fact that my tracker had stopped at 82km, and off to the bar, where I chose not to drink alcohol, but did tuck into some fish and chips. Out of bed early the next day, into the rental car, drove back to PMB to a school I support, stole a few Comrades Route Signs on the way, and back in Durban for the Bruce Fordyce after Party, where I did drink beer, then I was on the 6-30PM flight to Dubai and onto London, where I arrived at lunchtime Tuesday, a 5km run on Wednesday and a 10km Great Wales Trail Run on Saturday. So what happened to cause this disaster? -Did I manage my electrolytes well? With hindsight maybe I could have done better. -Did I manage my other nutrition properly? No, as I couldn’t hold down any solid food. -Did I manage my hydration well?, Yes, as I only took in a 1 litre bag in the medical tent, whereas in my 43km and 56km training runs I know I was 2 litres short of fluid at the end of these runs. -Did I manage my Blood Pressure issues? Yes and No, as normally when my BP falls to low levels I get warnings through feeling faint or dizziness, but on this occasion there was no warning, so I think the BP issue which was at the heart of the issue was caused by something else, like running out of all fuel, but I’m working on the problem. Not much, but what I learnt was important. I knew that Comrades could humble you, I knew Comrades could bring you to your knees, and make you dig deeper than you could ever have imagined, I knew that Comrades could question who you really are, I knew that like all other Marathons and Ultra’s, that it is safer to leave your ego in your hotel room, but what I didn’t know was that Comrades could reach deep into your soul and try to tear it out.